Gujarat temples exhibit a rich architectural marvel of the bygone era. These houses of gods and goddesses have been attracting millions of devotees. They range from the holy of holies like Somnath and Dwarka to wayside shrines. Whatever be their size and wealth all of them share one thing in common the intense faith of the devotees who can be seen trekking to places like Ambaji and Dakor for some favour received. When we talk of Somnath and Dwarka we deal with a period when the concept of time was not yet born. The temple of Somnath dedicated to Shiva is the first among the 12 Jyotirlings. It is the seventh temple in living memory. Known for its fabulous wealth it attracted the attention of iconoclasts in the course of its chequered history. Arrival Ahmedabad. Met and transfer to Gondal. Later in the afternoon visit the Palace and surroundings. Evening visit the Virpur (Jalaram Temple) Overnight Gondal. Overnight stay. After breakfast proceed to Somnath via Junagadh on arrival visit the Junagadh Ashok Rock Edict, Junagadh Museum and later Darshan at Somnath Temple. The Somnath temple is one of the twelve most sacred shrines dedicated to the Lord Shiva and a jyotirlinga. This temple has a very long history. According to the legends, the Somnath temple is very old and was originally built in gold by the Somraj, the Moon God. Later, it was rebuilt by Ravana, in silver; then by Krishna in wood and Bhimdev in stone. The current temple was built as per the traditional designs on the original site by the sea. Overnight Somnath (Veraval). Overnight stay at Hotel. After breakfast drive to Dwarka onway visit Porbander (130 Kms + 100 Kms) Visit the Home of Mahatma Gandhiji. Evening arrival at Dwarka, evening Visit of Temple Dwarka. Overnight Dwarka. Overnight at Hotel. Visit to Temples of Dwarka- Dwarkadish Temple. 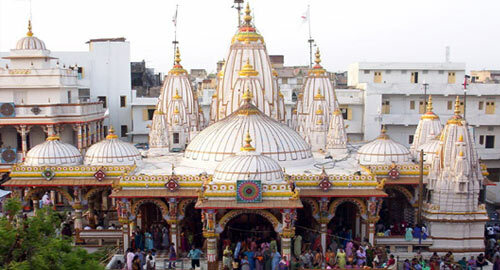 The most important attraction here is the temple of Dwarkadheesh, also known as Jagat temple. This five-storied temple, built more than 2000 years ago, rests on 60 pillars and many intricate carvings. Thousands of devotees come here everyday to pay their respects. Continue the sightseeing of Nageshwar & Jyotirlinga Temple. Overnight at Hotel. After breakfast drive to Rajkot (235 Kms) Afternoon visit Rajkot and nearby places. Rest of the day at Leisure. Overnight at Rajkot. Overnight at Hotel. After Breakfast Drive to Ahmedabad, on arrival check in at Hotel, Afternoon half day sightseeing of Ahmedabad & in time transfer to Ahmadabad Airport or Railway station for your next destination. The major tourist attraction spots include Swaminarayan Temple, Race Course, Aji Dam, Shri Ranchhoddas Ashram, Ramakrishna Aashram, BAPS Swaminarayan Temple, Ishwariya Temple, Watson Museum, Mukti Dhama, Jubilee Garden, Rotary Midtown Dolls' Museum, Yagnik Road and many more.